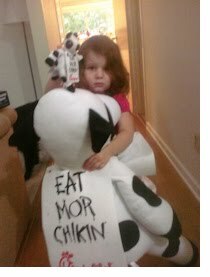 Death of a Pancreas: One more reason to LOVE Chick-fil-a! How COOL is this??? I LOVE Chik-Fil-A even more now!! If only waffle fries could cure diabetes . . . I hope they raise lots of money joanne and good luck . gotta love the chick fil a.
Dang girl - I'd almost travel to Texas to get some Chickie Fil and support your team!!! Great idea, btw - I'm going to check on it here! After all of Elise's chanting "Chick-fil-a, chick-fil-a!" it's about time they started chanting "Team Elise, Team Elise!" back at her! LOVE IT!